I have established a session specifically for People Living with Cancer and their Caregivers. In consideration of the physical, mental and financial stress associated with cancer, the session is only $50 per hour. I will also work on a sliding scale based on individual needs (honor system). If you can afford to pay the full price for one hour ($70), the difference will be used to help those in need of assistance. online booking service or call me directly at 502.523.2513. 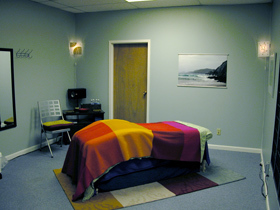 If this is to be your first visit you'll need to click here and download the Client Intake and Oncology Massage forms. I'm sure you've seen a lifetime of paperwork already, but we'll need this to insure that you get the best possible care. All forms can be complete in Acrobat before being printed. A connection through touch can be crucial to anyone when not feeling well. It provides a sense of nurturing and comfort that medicine cannot provide, something that is needed by everyone. Research of massage for cancer patients suggest massage can decrease stress, anxiety, depression, fatigue and pain. People living with cancer have special needs when it comes to touch/massage and must be careful in choosing a massage therapist. Many MTs and spas rely on very outdated taboos and information, some simply not wanting to take on oncology clients because they see them as a possible liability risk. Given the ongoing research of massage and it’s benefits for the oncology community, after a bit of questioning you should now be able to receive massage and feel confident in the care you are getting. It is important to educate yourself, and find a massage therapist that knows what he/she is doing. Particularly if you’ve had lymph nodes removed, be very cautious in your selection. A therapist who doesn’t know any better may perform the wrong technique or massage too close and increase your risk of lymphedema, a long-term condition that can create chronic and painful swelling. 1. Call before you go! First, describe your current state of treatment and ask if they will treat you. If the answer is no, keep looking! Research shows us that in most every case, properly performed massage is allowed for oncology clients. In fact, many hospitals offer as part of their cancer care. Ask about licenses and certifications. and ask if anyone on staff has experience working with not only cancer patients, but you’re particular condition. Avoid all aggressive therapies during cancer treatments, including deep tissue massage, hot stone therapy, Swedish massage, Shiatsu, sports massage, and anything that feels too rough. 3. Observe when you go for your appointment. Does your massage therapist ask questions? At the very least, he/she should have you fill out an extensive form detailing your medical treatments including surgery, chemotherapy, radiation, lymph node removal, ports, incision locations, white blood cell count, etc. Someone who doesn’t take the time to know this about you isn’t educated—go to someone else. 4. Ask about the type of products they’re planning to use. Ask to see the bottle and the ingredient list. Allow them to use only safe and nurturing formulas that are fragrance-free and made without sulfates, phthalates, and other potentially harmful ingredients. 5. Stop anything that feels uncomfortable. If anything hurts or feels uncomfortable to you, tell the therapist to stop. He/she should be more than willing to listen to you and make adjustments. If not, care enough about your health to leave. in the room, to the heated massage table (cold days) and lastly the music. I leave feeling better physical and completely relaxed." A. P.